Add a deck washdown system for a squeaky clean boat. Start by planning out your entire installation (hose runs, pump location, power supply, etc.) before drilling holes. Consider the washdown system’s water source. Most are plumbed as a “raw water” system utilizing the water your boat is in. 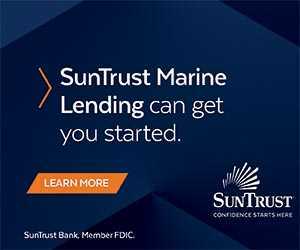 In the case of saltwater fed systems, this means you’ll still want to deal with the salty residue left behind once back at the dock (to avoid corrosion issues), but in my opinion, a salty boat is better than a nasty one any day. 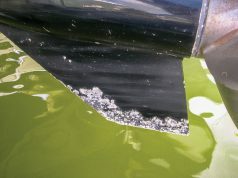 A second option is tapping into the boat’s freshwater system. This will typically limit the amount of water you can use (based on tank size) but does have the advantage of reducing the effects of corrosion on metal components via freshwater washdowns. A third option is plumbing your system to draw from both. This gives you an unlimited supply of saltwater to power off grime, plus the option of a final freshwater rinse with minimal drain on your potable water supply. Freshwater washdown systems are plumbed into the freshwater system at some convenient point (possibly near the tank). Raw water systems require either a dedicated thru-hull or connection via a “T” fitting into an existing raw water system hose. Using an existing thru-hull is the most common route, as most owners tend to shy away from cutting additional holes in their boats. It also has the added benefit of allowing you to complete the installation with the boat in the water by simply shutting the seacock of the raw water system you’re tapping into. Pump selection (and adequate water flow) are the most crucial aspects of the system. Nothing is more frustrating than trying to power off anchor chain crud with a wimpy stream of water. The trick is finding a moderately priced pump that not only provides adequate pressure with minimal power draw but can also stand up to the marine environment. A typical deck washdown pump’s output pressure ranges from 3-12 GPM (gallons per minute) with prices of $100 or less to over $1,000. 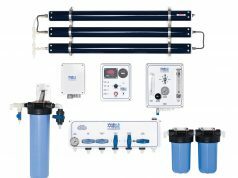 Buying a deck washdown package (a kit that includes pump, deck fitting, deck hose, etc.) will often save money. Also, the pump’s warranty can vary from one to three years—the longer coverage period, the better, of course. When selecting a location for your washdown pump, choose an accessible area well above where bilge water accumulates. 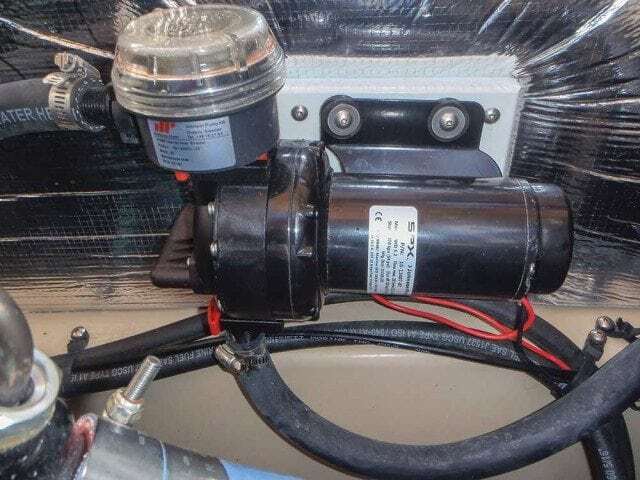 The pump should also be between the water supply and planned deck outlet, ideally as close as possible to its power source to simplify wiring runs. As pumps are more efficient at pushing water than pulling, the location should also be as close as possible to the supply thru-hull or freshwater tank. Be sure the pump installation itself is in accordance with the manufacturer’s instructions and that it includes an intake strainer between the pump and water supply in order to prevent pump damage due to debris. Pumps vary in their ability to self-prime or lift water vertically in order to start pumping. Some are rated at 8-9 feet, while others may only be able to overcome 2 feet of “head” when pumping. Make sure the location you’ve chosen doesn’t exceed the pump’s self-priming ability. If installing a freshwater-only washdown system, don’t be tempted to simply cut into the system and use your existing freshwater pump. You can do it, but don’t expect too much from such an install. Pumps used in freshwater systems weren’t designed to move large amounts of water quickly and lack the pressure of a good washdown pump. 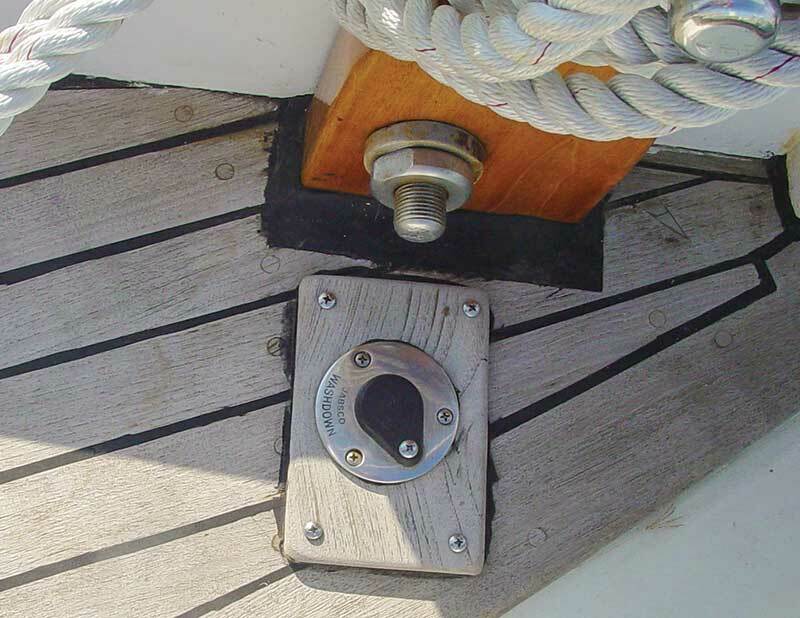 When planning your install you’ll also need to figure out where to locate the deck outlet. Most folks simply mount it on the foredeck (close to the anchor) as cleaning ground tackle is often viewed as its primary job, however there’s no rule saying you have to put it there. Regardless of where you decide to install the outlet, make sure you have enough space beneath the deck to accommodate the hose and associated fittings and that you won’t be drilling into anything unexpected (wiring or cables) while cutting the mounting hole. Seal the edges of the hole with thickened epoxy when cutting through cored decks (balsa, plywood, etc.) to prevent water intrusion into the core (and rot) later on. 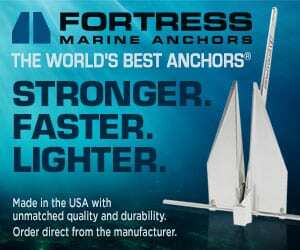 Bedding the fitting with a suitable marine caulking will help in this regard as well. Installation of a pressurized washdown system is an excellent return for a relatively small investment of time and money. 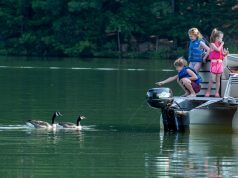 Cleanups after raising the anchor will be a cinch, and you’ll find so many other uses for the system—hosing off the dog, rinsing the dingy, giving the kids a bath—you’ll wonder how you ever got along without it.